The vision of the Semantic Web is to enhance today's Web by exploiting machine-processable metadata. The explicit representation of the semantics of data, enriched with domain theories (ontologies), will enable a web that provides a qualitatively new level of service. It will weave together a large network of human knowledge and makes this knowledge machine-processable. Various automated services will help the users to achieve their goals by accessing and processing information in machine-understandable form. This network of knowledge systems will ultimately lead to truly intelligent systems, which will be employed for various complex decision-making tasks. Semantic Web research can benefit from ideas and cross-fertilization with many other areas: Artificial Intelligence, Natural Language Processing, Databases and Information Systems, Information Retrieval, Multimedia, Distributed Systems, Social Networks and Web Engineering. Many advances within these areas can contribute towards the realization of the Semantic Web. The continuing success of ESWC as a premier publication place in the area of semantics has culminated in a record number of high-quality submissions for ESWC2007 (270 submitted papers, acceptance rate 17%) which we expect to be exceeded again this year. As a consequence the steering committee and the organizers of ESWC2008 have decided to extend the main conference from 2 days to 3 days. 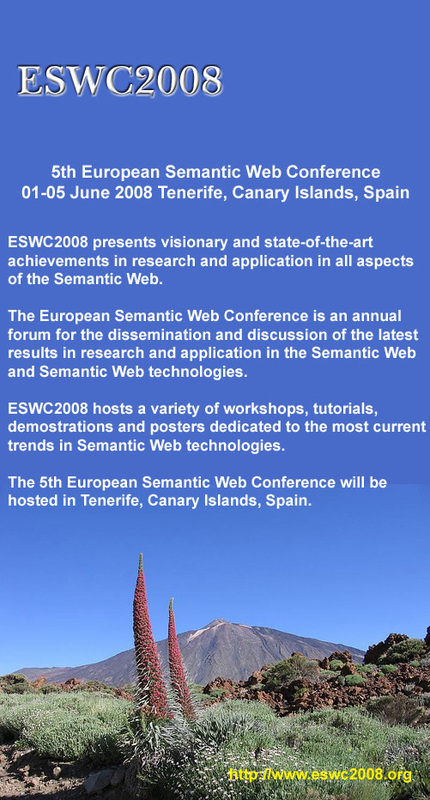 The 5th Annual European Semantic Web Conference (ESWC 2008) will present the latest results in research and applications of Semantic Web technologies. ESWC 2008 will also feature a tutorial program, system descriptions and demos, a posters track, a Ph.D. symposium and a number of collocated workshops. ESWC 2008 is sponsored by STI2, Semantic Technology Institutes International. For more information on STI2, please visit http://www.sti2.org.